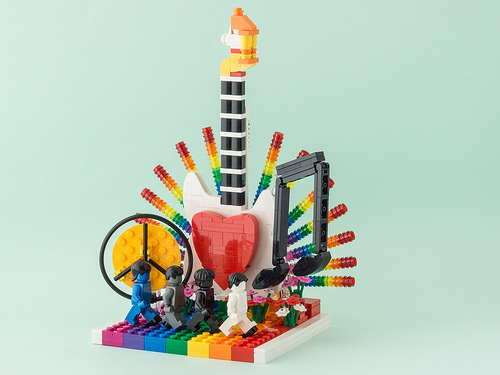 This Beatles tribute by Singaporean builder Tan Kok Mun features the Fab Four in a colorful and imaginative collage featuring several key themes that the legendary band was known for during its heyday. The symbols of peace and flowers asre universal, with a guitar and musical notes floating to the echo of the familiar music that plays in our minds. With the added touch of a heart over the guitar’s sound hole and the headstock playfully replaced with a tiny yellow submarine, what’s not to love about this charming tribute?